Alen - T500 Tower : Air Purifier Review • The Air Geeks, reviews of air conditioners, dehumidifiers and air purifiers. The Alen T500 is a compact air purifier that is suitable for medium-sized spaces. This air purifier is capable of capturing a wide variety of airborne contaminants to ensure that your space is dominated by clean and fresh air. This portable unit can be easily moved from one position to another. In addition, this unit is designed to consume minimum power. Have you been struggling to eliminate airborne contaminants from the air in your room? If your answer is yes, then you should consider this customizable air purifier. If you are already planning to order one for your air cleaning needs, we have compiled all the details that you need to consider prior to ordering your unit. Without further ado, we will begin by exploring its features. The T500 is a compact air cleaning solution that employs HEPA-type filtration to transform the indoor environment of your home. According to the manufacturer, this unit is capable of capturing up to 95% of airborne particles from the air in your room. It is also capable of capturing airborne pollutants that are as small as 0.3 microns. This air purifier is suitable for medium-sized spaces such as bedrooms, living rooms, study rooms, offices, and so on. The manufacturer recommends this air purifier for spaces that are up to 500 square feet. However, we have observed that the unit performs better when it is used in smaller spaces. If your room has limited space, then you should look for an air purifier that is designed to fit in such environments. The T500 blends compactness with performance to ensure that your space is free from potentially harmful airborne contaminants. In addition, this unit is light and you can move it from one room to another with ease. Its size and weight also make it a suitable choice for people who like carrying their air purifiers when travelling. Which airborne contaminants are you planning to eliminate from your room? The T500 tower air purifier is optimized to capture a variety of airborne pollutants including microbes, allergens, bad smells, and chemical pollutants. If you have been coughing or sneezing due to high concentrations of dust, pollen, or mold spores in your office or home, then this air purifier can help to transform your space. The effectiveness of an air purifier is dependent on the quality of the filters used. This air purifier is fitted with a high quality HEPA filter that captures a high percentage of airborne contaminants. Alen offers four different types of filters to ensure that the air in your room is always fresh and clean. Each of these filters is precisely designed to meet your unique air cleaning needs. 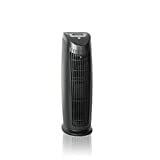 Furthermore, the T500 tower air purifier is an Energy Star certified product. As such, it is designed to consume minimum power. If you are looking for a unit that will enable you to save money, then the T500 is a suitable choice. Replacing a worn out filter with a new one helps to enhance the performance of your air purifier. The T500 features a filter life indicator that helps to remind the user to replace an old filter. On average, the filter should be replaced after every 12 months. In case you are highly sensitive to noise, then this unit may not be a suitable choice for you. At the highest speed, it produces a loud sound. The unit should be set to the lowest speed for quietest operation (see a description on the Alen website here). Are you looking for a unit that has a true HEPA filter? If your answer is yes, then you need to consider another option. The filter used by this air purifier is less effective as compared to a true HEPA filter. Unlike a true HEPA filter, the filter used by this air purifier is only capable of capturing 95% of airborne pollutants. Small and light. The size and weight of this unit enables you to move it from one position to another with ease. Its compactness makes it a suitable choice for rooms with limited space. Easy to set up and operate. You can set up the unit in less than ten minutes. 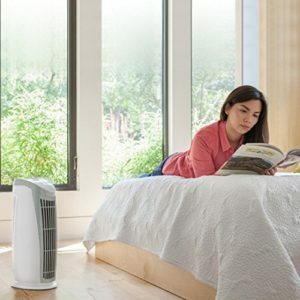 Its intuitive controls allow you to adjust the air quality conditions of your room with ease. Lacks a true HEPA filter. If you are looking for an air purifier that delivers a true HEPA performance, then you should consider another option. As compared to a true HEPA filter, the filter used by this air purifier is less effective. Relatively loud. This unit produces more noise as compared to most air purifiers of same capacity. Excellent product for the most part. We purchased this model due to the weight and size. Its quite small and light...easy to move around the house. This was one of the only models I found with these specs, that covered up to 500 sq feet. It very clearly works! Most of the dust and dander in our house has disappeared since we started using this. The only negatives are noise, it's definitely loud on the highest setting. It also cools the room down which has not been ideal during the winter. We only turn it on high when we are not in the room." Relief for allergies!! This air purifier does exactly what it claims to do, and we are thrilled with our purchase. Almost instantly, the air in our family room (where we often gather with our cats and dog) is now fresh and my normally itchy eyes are allergy-symptom free! THANK YOU, ALEN! I would HIGHLY recommend this for anyone who is looking for an effective air purifier that also takes up minimal space." If you are looking for a light and compact air purifier, then the T500 tower air purifier is a suitable option. It is also designed to allow easy set-up and operation. On the downside, this unit does not deliver true-HEPA performance. Considering that you now have all the critical details about this air purifier, it is up to you to decide whether it is the best option for your air cleaning needs.